Insolito wins in his debut. AULL vs Neza. Three quick falls. Both refs were looking at dives, and Tony & Yakuza both faked fouls. Referees gave the win to the AULL team. Rudos took 1/e. Eterno and Kabuki feuded, Eterno defeating Kabuki (with some help from Hijo de Mascara) in the third. Rudos took 2/3, Truama II submitting Golden Magic. Primos Dinamitas took 1/3 clean. Universo's debut here. Straight falls. Dos reversed a suplex into a small package to take the first. Cien Caras Jr., Demon's second, accidentally hit the challenger with a senton in the second to set up the loss. Demon was upset with Cien but Cien ignored him and challenged Dos for a titel match. First defense for Hijo de Dos. 1) Galaxy COR Matrix Jr.
Matrix was hurt and strechered out. Apolo Estrada replaced Silver Star (and "El Divino" was Monterrey's El Divo.) Guerrero Mixtico Jr. and Picudo replaced Rayan and Spartan. 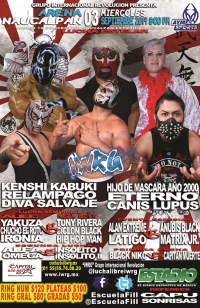 Miss Gaviota & Alan Extreme replaced Kenshi Kabuki & Metaleon. Team AULL wins again. luchadors in the match got annoyed with being strapped so much by the lumberjacks, so they stole the strap and attacked the lumberjacks. Tecnicos beat the rudos in the ensuing chaos. Tecnicos took 2/3, with Cerebro submitting Diablo and challenging him to a future hair match. Bombero Infernal (wearing Fresero's gear and boots) was a last second replacement for Hijo de Dos Caras. 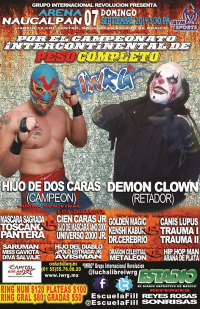 Veneno and Demon Clown feuded instead, with Demon splashing Veneno for the win. Junior Dinimitas ran in to attack Demon after the win. The Traumas followed and the main event started immediately. 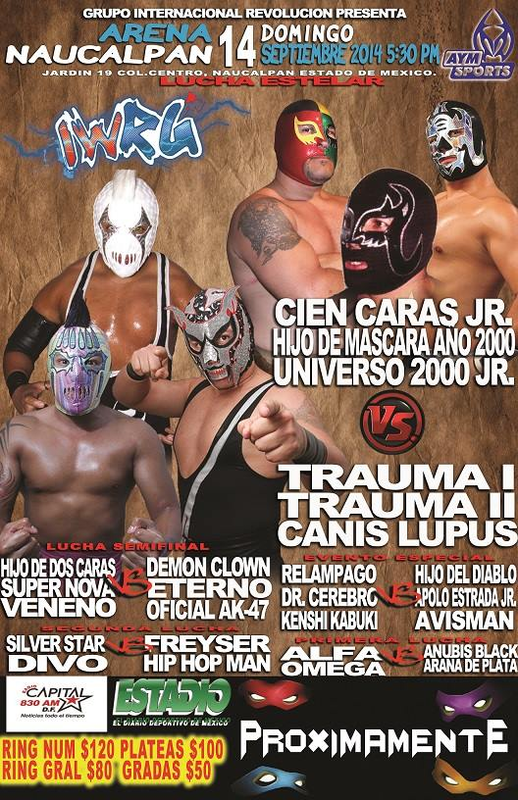 compelte brawl, with Universo 2000 Jr. in particular getting a harsh welcome to IWRG by the Traumas. 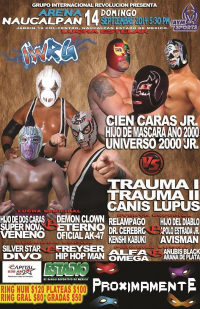 Capos took fall 1, Traumas/Canis took fall 2, Trauma II had Cien Caras in the spider leg lock when Demon Clown ran in, kicked Trauma and then attacked Cien. (No winner was announced but it appeared the Traumas won by DQ.) Demon destroyed Cien in revenge, ripping up his mask. Challenges followed post match. AULL vs Neza Boys. Changed to 6 vs 6 with various peoplemissing. Yakuza beat Tony Rivera, though Tony argued he kicked out in a time. FILL vs IWRG. Changed to a 7 on 7 with some subs. Veneno beat Fresero Jr. to win. 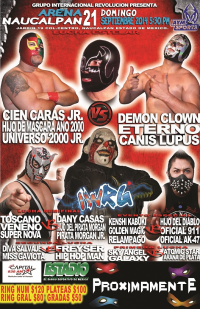 Team IWRG will face Team AULL on a future show. Rudos took 1/3. First Pirata Jr. match here this year. Demon Clown jumped the Capos. 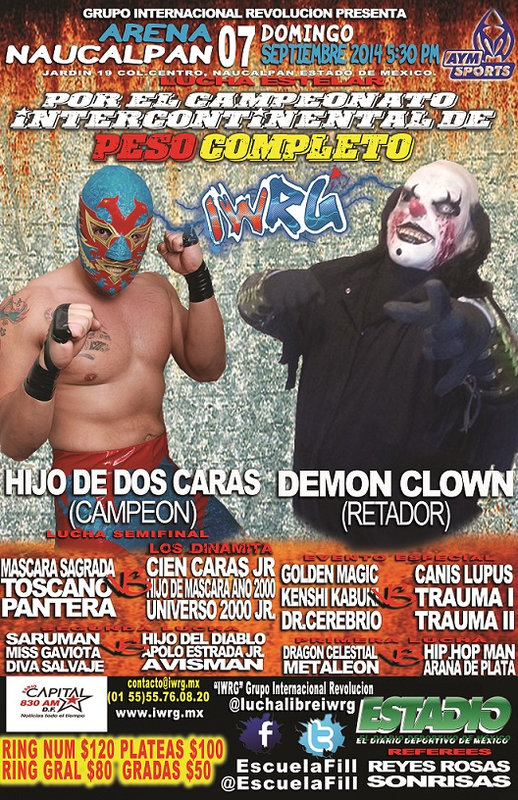 Team Demon Clown took 1/3, with Demon Clown beating up Cien Caras on the outside while Lupus & Eterno beat the others. Marduk wins in possible debuts for both guys. There was previously an Extrano in 2005 and 2009. 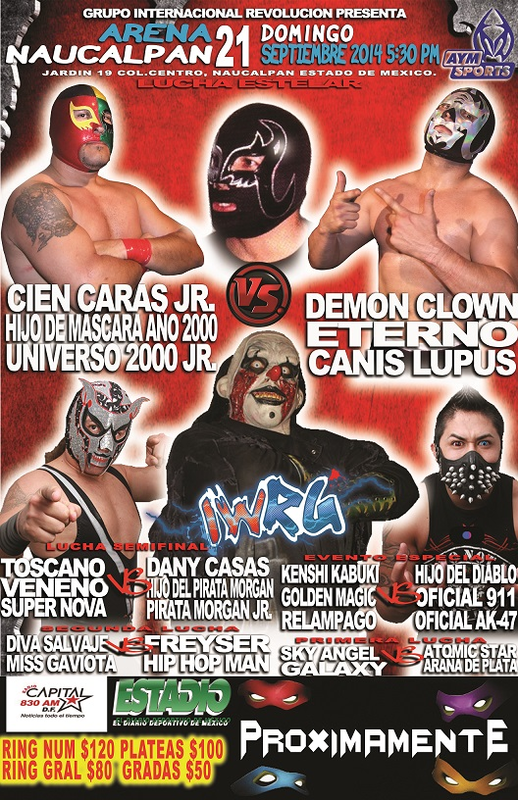 There is a Marduk wrestling in Queretaro (and the same one in Guanajuato?) - it's unclear if this is that guy. Alan Extreme replaced Canis Lupus. 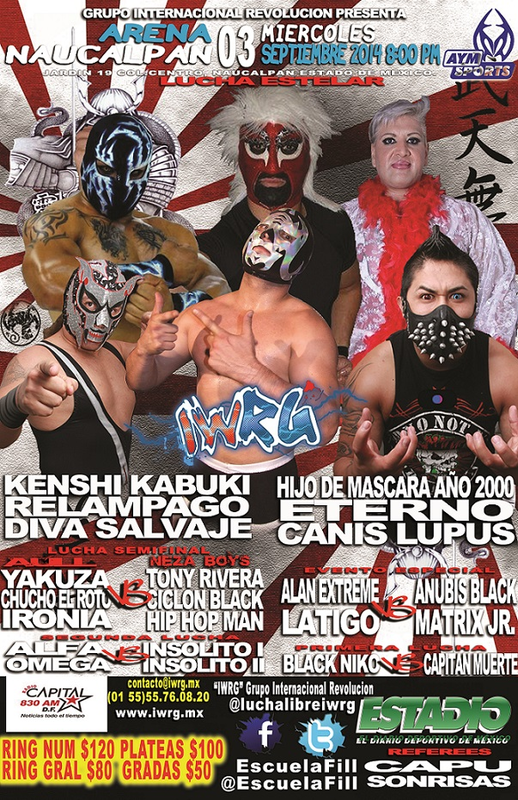 Relampago submitted Yakuza to win it for team IWRG. straight falls. Gringos have passed over a year of being Mexico State champions. Hijo de Dos returned. Tecnicos took 2/3 though the third fall finish was confusing. Mascara had Dos down and covered him for a three count according to referee Sonrisas, but referee Reyes Rosas ruled Dos got a shoulder up in a time. Confusion followed, and Dos suplexed Mascara for the win. 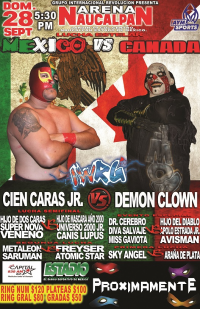 5) Demon Clown DQ Cien Caras Jr.
Mexico vs Canada! Demon Clown jumped Cien, who was not really helped by Mascara hitting him with a chair by mistake. Demon took the middle rope splash for the second. Ref Rosas was taken out in the second fall, leading to Mascara coming in to help beat up Demon Clown, but the ref came too and DQed the Capos. Straight falls for Demon Clown. Cien, having lost in two falls, challenged Hijo de Dos for a title match and Demon for a rematch. Dos appeared to accept the title change.